Veterans Day isn’t supposed to be a somber occasion; it’s a celebration honoring the brave service men and women who risk it all to defend our freedom and keep us safe. This year, the IBEW 1245 Veterans Committee participated in Veterans Day parades in Sacramento, Fresno and Redding to reinforce our union’s commitment to current and former military personnel and honor all who have served our nation. IBEW 1245 Veterans Committee member Walter Carmier. 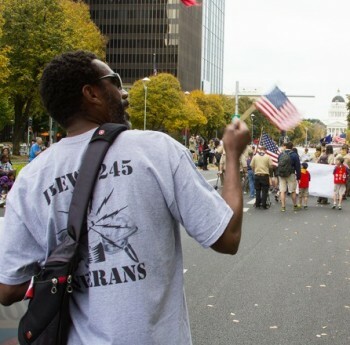 In Sacramento, more than 30 IBEW 1245 veterans, members, family and friends joined the marching contingent at the city’s 4th annual Veterans Day Parade. The marchers held an IBEW 1245 Veterans Committee banner and donned matching tee shirts, and were accompanied by an IBEW 1245-themed pickup truck, decorated with flags, banners and signs. Veterans Committee members Walter Carmier and Pamela Pendleton organized and led the contingent, while IBEW organizers Jammi Juarez and Jennifer Gray drove along in the truck. At the Fresno Veterans Day Parade, approximately 35 people joined the Local 1245 contingent, including veterans, members and their families. The Fresno event is widely known to be the biggest Veterans Day Parade on the West Coast, and the IBEW 1245 marchers noticed many friends and co-workers in the crowd that lined every inch of the mile-long parade route. IBEW 1245 Veterans Committee members Joe Sanchez and Vicki Bunag worked to coordinate the contingent, and Sanchez was pleased to have the opportunity to have his daughter marching by his side during the parade. 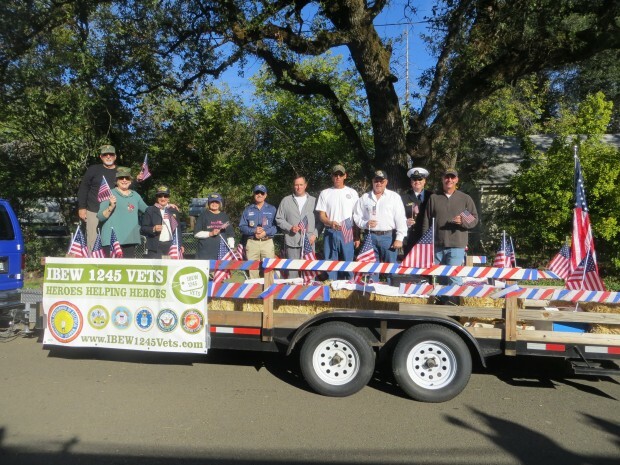 In the Redding area, the IBEW Veterans group did in fact enter a float in the Shasta Lake Veterans Parade, which they decorated with two dozen American flags, patriotic streamers and two IBEW Local 1245 Veterans Committee banners. IBEW 1245 member Dave Vandermeer drove a City of Shasta Lake line truck behind the float with a banner that read “Supported by IBEW Local 1245” while Assistant Business Manager Ray Thomas navigated the parade route in the IBEW 1245 van. IBEW Veterans Committee members Phil Alleman and Mike Grandmain coordinated the Shasta Lake contingent, which included Local 1245 members as well as several honored guests from the Redding Veteran’s Resource Center.